The holidays are sneaking up on us very quickly. It is a time for laughter, peace, spending time with your loved ones, and much more. For some people, the holidays are the worst, leading to a very depressed state of mind. 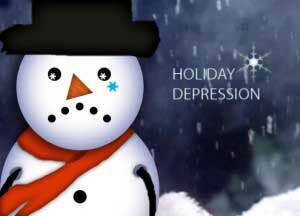 Depression does tend to be higher during the holidays, buy why? Social isolation is one of the biggest triggers of depression, especially during the holidays. People, who have feelings of loneliness and disconnection, tend to isolate themselves from events and other activities. Isolation makes your depression worse. People find themselves asking the same questions over and over again. Why can’t that be me having fun with my family? Why does everyone else seem so much happier than me? What is wrong with me? This type of behavior leads these people to question the quality of their relationships with other people. Another trigger is the media. When you turn on the television, flip on the radio, go shopping at the mall, or even simply eating out at a restaurant, what do you see? You see people smiling, laughing, groups of families and friends sharing gifts and food. Basically, you see people extremely happy 24 hours, 7 days a week during the holidays. This can bombard you mentally, the same way that the media portrays certain body types. For example, in most model pictures, they use Photoshop to create a flawless, skinny, body image. This then leads to people feeling inferior to the images they are looking at. Creating a constant holiday cheer, while it seems harmless, actually makes certain people question their behavior and wonder why they are not always happy 24 7, like the pictures they see. Depression during the holidays is also caused by grieving. Holidays are a time for traditions and getting together with family in friends. If you have recently lost a loved one, it reopens that fresh wound. I remember my first holiday season after my Grandpa died. It was heartbreaking. It was so bad, that I did not even want to go to my Grandma’s house. I did not want to be reminded that he was no longer there. Our society also frowns upon certain behaviors. Grieving for too long and depression itself is looked at as “not normal”. This behavior then makes the person feel ashamed they have these feelings and in turn they isolate themselves. Feeling upset that a loved one will not be with you this holiday season is normal and you should not be ashamed to admit that you are upset and depressed over it. I did end up going to my Grandma’s house that year and I’m glad I did. You see, those horrible feelings I was suppressing inside me, were the same feelings that everyone else had. My family was able to laugh, cry, and most importantly, share stories about my grandpa. This helped everyone deal with the loss of my Grandpa and move forward with the holiday season with a smile on their faces. So if you are feeling down this holiday season, remind yourself that life is not a movie. You will not be happy every hour of every day. Exercise or go for a walk to boost your mood. Exercising can create the same effects that anti-depression medication can. Most importantly, do not isolate yourself. Go to that party you were invited to, talk about your lost loved ones, or even invite for friends in family out or to your house this holiday season.